Jat Tehnika Base Maintenance offers comprehensive maintenance, repair and overhaul services on Boeing 737 Classic/Next Generation, ATR 42/72 and Airbus A320 family. With vast experience – DC-3, legendary B707, DC-9, B727 and DC-10 to present day airplanes – B737NG, ATR42/72 and AIRBUS A320, we have built up extensive expertise in serving different aircraft operators and leasing companies for more than 85 years. With turnaround of more than 50 aircrafts per season on various checks, teams of highly trained and experienced mechanics and engineers are ready to fulfill all aircraft maintenance and modification requirements. As part of constant improvements, Base Maintenance regularly recruits young professionals. Base Maintenance Facilities consist of two hangars – H1 and H2. Hangar H1 has 7142m2 with 14m high doors. It was built of concrete, with steel barred roof. 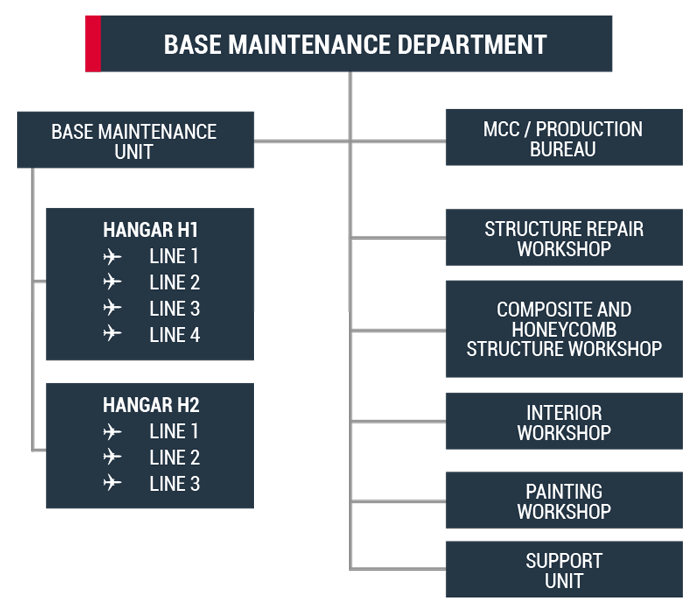 Hangar is divided in two areas; first one for C, D, SI checks, major repairs and modifications of B-737, ATR-42/72, and second one for the purpose of line maintenance (A, B, C checks), minor repairs and modifications. Located in this hangar are following Component Maintenance Department workshops: Radio, A/C Instrument, Electro, Hydraulic and Mechanical, Landing gear (wheels and brakes), as well as NDT Department, Structures and composite workshops, Painting workshop, Interior and emergency equipment workshops and Aircraft Maintenance Tool Shop. Hangar H2 has useful surface of 9230m2 with 21 m high doors. It was built of reinforced concrete. Hangar is designed for maintenance of large airplanes (DC-10, B-747, A340). This hangar has integrated calibration workshops covering 516 m2 as well as separate office space. It is now used for B737 CL/NG, ATR 42/72 and A320 maintenance. Base Maintenance Department uses dynamic labor arrangement scheme to cover 7 days a week. It is organized in several units with maximum capability of seven lines for heavy maintenance and 2 more for minor maintenance and repairs.